Never let your sense of failure corrupt your new action. Mothers, we fail. It is true. You cannot hide your failures. from the world looking in. You cannot hide them from you husband, little ones, yourself, or God. Although we've talked about not being enough, we cannot lose heart when we fail. What do we do when we fail? When David became king, he decided to bring the ark back to Jerusalem, where it belonged. Although David had pure motives, he did not seek God's counsel in how to transport the ark. 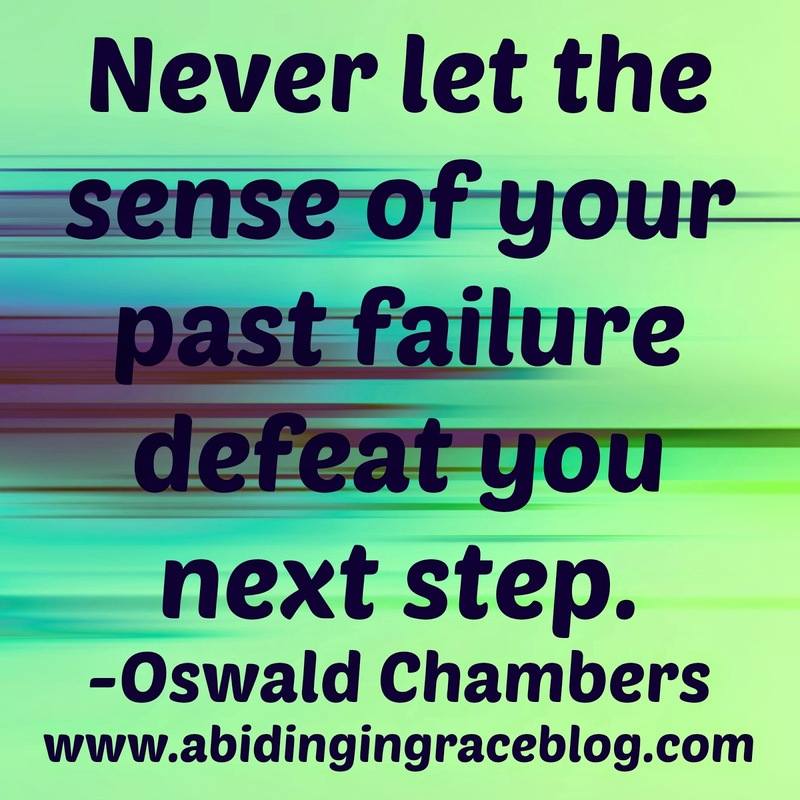 In 2 Samuel 6 we read of how a horrible mistake was met with a disastrous end. David sent 30,000 men from Israel to go and get the ark from Baale Judah. David traveled with them, playing music and rejoicing. The ark was put on an ox cart and a few men stood around to protect it. Suddenly, the cart hit a bump the road and the ark almost toppled to the ground. A man named Uzzah put his hand on the ark to steady it. It says in verse seven, "The anger of the Lord was aroused against Uzzah, and God struck him there for his error; and he died there by the ark of God." David's response seems reasonable, "And David became angry because of the Lord's outbreak against Uzzah." Why would God kill a man for just touching the ark? If David had read the instructions of God in the Books of the Law, he would have seen that only Levite priests were allowed to move the ark. There were also strict rules for how to touch the ark. The ark of God represented His presence with them. Never were they to take it lightly. God was to be feared and reverenced as much as He was to be loved and worshiped. When David made that mistake, we find that he did not just abandon the project. He did not wallow in self-pity or doubt. He searched the Scripture and realized that burnt offerings and sacrivides were necessary for moving the ark. In verses 12-15 we see that David did eventually move the ark to Jerasulam, and God blessed it. David did not let his sense of failure detour him from what he knew he had to do. Do not let failure keep you from doing what is right. We fail as a mother or wife and feel as if we will never get it right - so why try? Because God says: His Grace is Enough and to Keep Working. We are not to abandon our duties because we fail. We move on to the next step! It might mean we need to confess. It might mean we need to learn a lesson. Either, way keep moving forward. We sometimes fail because we are living in sin. We are to confess our sin (I John 1:9) and begin to live in God's grace. We sometimes fail because we were not knowledgable. We need to study and learn from our failures, so not to make the same mistakes again. God is full of grace. He is a patience teacher. Although there will be consequences sometimes for our failings, nothing is too far for God to redeem. Nothing. Not death. Not sickness. Not rebellion. Nothing can separate us from God's grace. Sharing my "Honest Moments" along with Keri at Living in This Season.